Discover why being a "fast second" is often more financially rewarding than being at the cutting edge. If you get there first, you'll lead the pack, right? Not necessarily! 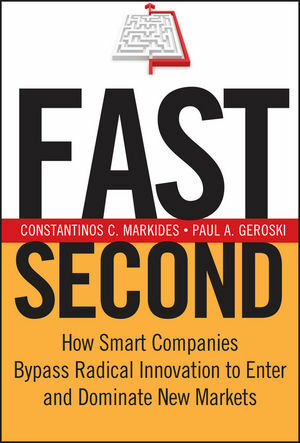 The skill-sets of most established companies, say strategy experts Constantinos Markides and Paul Geroski, are far better suited to scaling up newly created markets pioneered by others (in other words, being "fast seconds") than to creating these markets from scratch. In Fast Second, they explore the characteristics of new markets, describe the skills needed to create and compete in them, and show how these skills match up with different types of companies. Drawing on examples of successful fast-second firms such as Microsoft, Amazon, Canon, JVC, Heinz, and many others, they illustrate how to determine which new markets have the potential to be successful and how to move into them before the competition does, when to make a move into a new market, how to scale up a market, where to position a company in the market, and whether to be a colonizer or a consolidator. Constantinos C. Markides is professor of strategic and international management and holds the Robert P. Bauman Chair of Strategic Leadership at the London Business School. He is the author of numerous articles and books, including All the Right Moves: A Guide to Crafting Breakthrough Strategy, and is coeditor of Strategic Thinking for the Next Economy from Jossey-Bass. Paul A. Geroski was until recently professor of economics at the London Business School. His research interests were innovation, competitive strategy, and competition policy. He is currently the chairman of the Competition Commission in the United Kingdom. 1. Spotting the Real Innovators. 2. Where Do Radical Innovations Come From? 3. From New Technologies to New Markets. 5. From Colonization to Consolidation. 6. Racing to Be Second: When to Enter New Markets. 7. The Changing Basis of Competition. 8. Creating the Markets of the Twenty-First Century.